Learn more about the effects of alcohol during pregnancy and sign the pledge today. 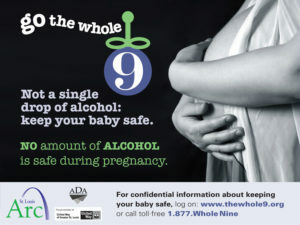 Go the Whole 9 is a program of the St. Louis Arc that is committed to providing education about fetal alcohol exposure. While most developmental disabilities are caused by genetics, alcohol use during pregnancy remains a leading preventable cause of problems related to brain development, including intellectual disabilities, and birth defects. Alcohol use during pregnancy is a leading preventable cause of intellectual disabilities. Go the Whole 9 offers educational resources for individuals, families and the community. To download fact sheets, toolkits, make the pledge, or to schedule a community presentation, visit the Go the Whole 9 website here. Thank you to the students of Webster University’s Production House course, for creating the St. Louis Arc Prevention PSA.